California is in the news again as another proposed law is aiming to ban plastic bags from supermarkets across the state. In the proposed bill, which is a collaboration between Senators Kevin de León (D-Los Angeles), Alex Padilla (D-Pacoima) and Ricardo Lara (D-Long Beach), not only would single-use plastic bags be banned, but stores would be allowed to charge 10 cents for every recyclable bag shoppers need and plastic workers would be retrained. The ban is intended to reduce thin film plastic bags and the environmental harm that results, while the fee is devised to discourage shoppers from simply replacing their disposable plastic bag habit with a dependency on paper bags. If signed into law, grocery stores would be prohibited from handing out single-use plastic bags starting in 2015. The bill also mandates a minimum 10-cent fee on recycled paper, reusable plastic and compostable bags. Shoppers would be encouraged to bring their own reusable grocery bags when they shop. This is not the first time a state-wide ban has been proposed in California. A common criticism of disposable bag bans, and one of the contributing factors that lead to earlier proposals being voted down, is that eliminating these single-use nuisances will reduce plastic bag manufacturing jobs. Well the trio of Senators behind the most recent proposal has learned from these earlier setbacks because the new measure will also provide financial incentives for worker re-training and company re-tooling. 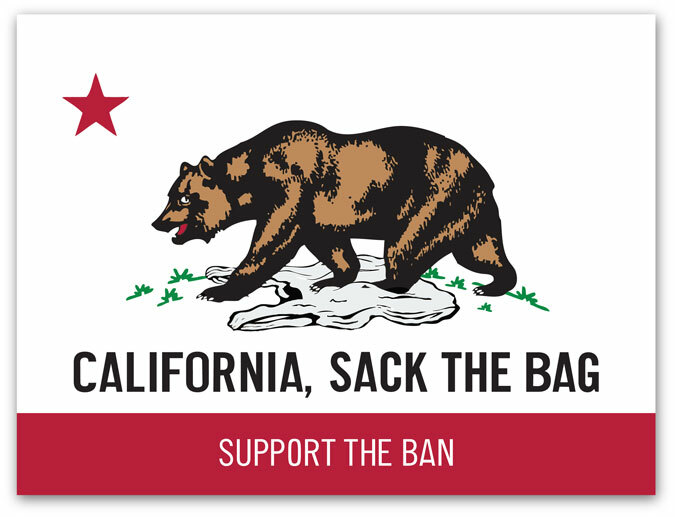 Currently there is a patchwork of bag bans that spread across California with nearly 100 cities, counties and municipalities that have ordinances banning single-use bags on the books; and there are many more bans in the works. A state-wide ban is a logical solution for California since this is an issue that is clearly near and dear to many residents. Localized bans are admirable and they make a difference, but they do not have the reach that a state-wide ban would have. The proposed law will maintain existing disposable bag legislation so cities that currently have bans will continue to have their bans in place, but a state-wide law will fill in the gaps. Ultimately, a state-wide ban will allow the entire state of California to reduce the use of single-use plastic bags and the environmental harm these bags cause. A law that applies to the entire state will certainly not please the dissenters, but it will be easier for all shoppers and better for the planet. Plastic bag litter causes trouble in many ways to both the environment and consumers but California has a front row seat when it comes to the damaging impact single-use plastic bags have on the ocean, marine ecosystems and animals. This could be a major reason why disposable bag bans gain so much momentum there. We are optimistic that this proposed ban will be passed since it has been tailored to address a lot of the issues that have caused previous bag bans to be voted down. We’re pulling for California and we will keep you posted as developments are made. If you have anything you would like to add to this story, please leave a comment below.